Oh, listen to me! The eclipse is a very good occasion. It is of three kinds, relating to the Sun, Moon, or fire respectively. On the forehead of Sakti (Durga) fire exists, in her left eyes glows the Moon and in her right eye the Sunshine. 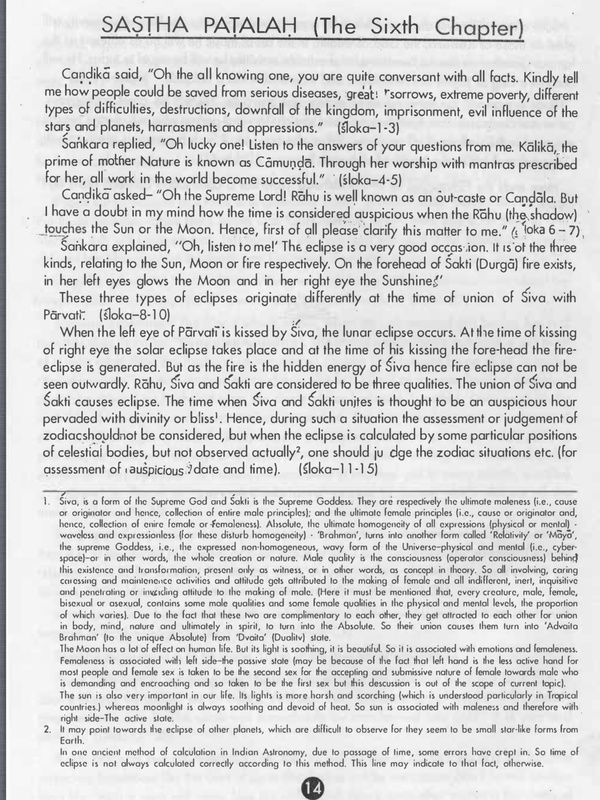 These three types of eclipses originate differently at the time of union of Siva with Parvati. When the left eye of Parvati is kissed by Siva, the lunar eclipse occurs. At the time of kissing of right eye the solar eclipse takes place and at the time of his kissing the fore-head the fire­ eclipse is generated. But as the fire is the hidden energy of Siva hence fire eclipse can not be seen outwardly. Rahu, Siva and Sakti are considered to be three qualities. The union of Siva and Sakti causes eclipse. The time when Siva and Sakti unite is thought to be an auspicious hour pervaded with divinity or bliss. Now solar eclipses and lunar eclipses are well-known astronomical phenomena. But my question is, what scriptures describe fire eclipses? Also, the passage says that fire eclipses are not visible, but is it possible to calculate when they occur? After all, Rahu, Ketu, and the other Upagrahas or shadow planets are not visible, yet their location can still be calculated mathematically. So is it similarly possible to mathematically calculate the location of the fire which is said to be "the hidden energy of Siva"? Browse other questions tagged mythology agamas tantra shaktism eclipse .